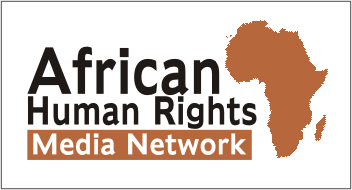 Cost of Kenyan homophobia: $1.3 billion per year – Rights Africa – Equal Rights, One Voice! Discrimination against LGBT+ people in Kenya costs the nation 18 billion to 130 billion Kenyan shillings (U.S. $180 million to $1.3 billion) per year, according to a new report. In Kenya, discrimination against LGBT+ people costs the nation up to U.S. $1.3 billion per year, or 1.7% of GDP, according to a new report. Click to download it. 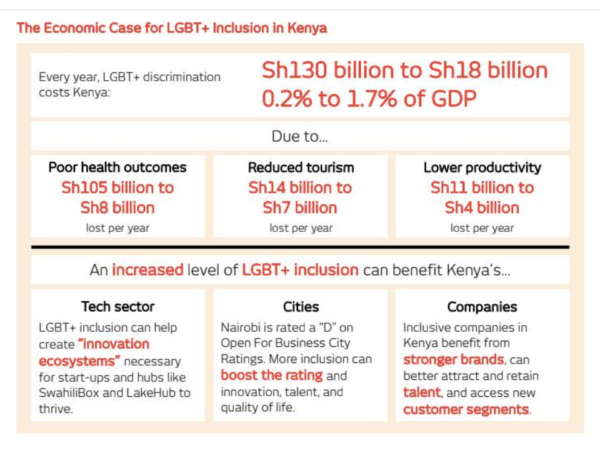 The report from the London-based Open for Business coalition states that LGBT+ inclusion would be a key ingredient for economic growth in Kenya, where anti-LGBT+ discrimination is costing the country up to 1.7% of GDP per year. 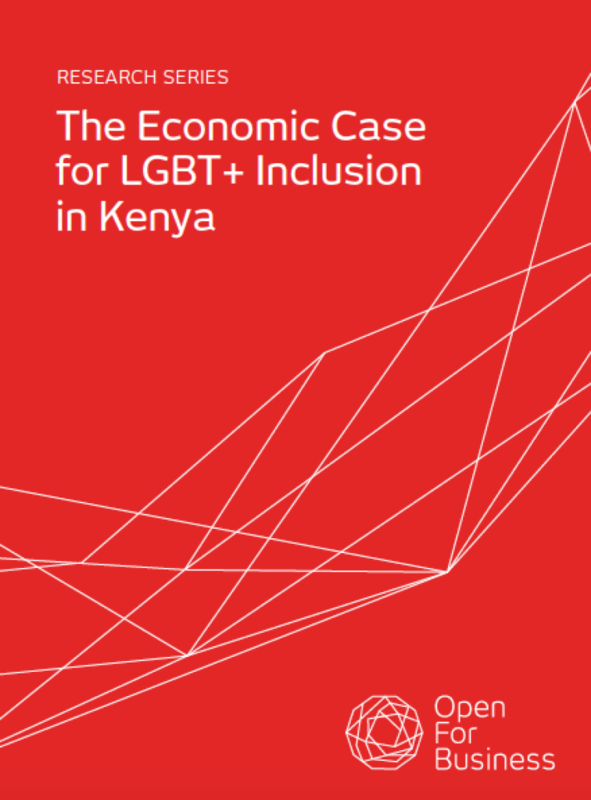 If Kenya focused instead on LGBT+ inclusion, that approach could help provide the country with what it needs for sustained economic growth, the report states. Open For Business is a coalition of global companies, including Google, Deutsche Bank, IBM and Microsoft, which believe that inclusive and diverse societies encourage economic growth. They seek to build a consensus in the business community that anti-LGBT+ policies run counter to the interests of business and economic development. They also support gay-friendly advocates in local business communities, providing them with evidence and fact-based arguments against homophobia. The new study of the cost of Kenyan homophobia concludes that discrimination against LGBT+ people costs the nation up to 130 billion Kenyan shillings (U.S. $1.3 billion) per year. Our purpose challenges us to look at the most immediate needs of our society, and find solutions that transform lives. Our focus on Diversity and Inclusion is an intentional effort towards ensuring inclusivity for all in the community. In financial year 2017/18, we continued to embed diversity and inclusion as a way of life. During the period under review, we accelerated efforts to ensure Safaricom mirrors the communities we serve. 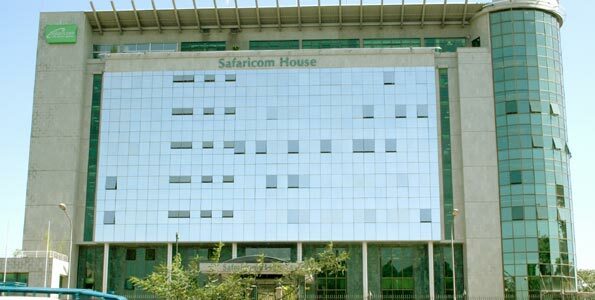 Safaricom House, the corporate headquarters of Safaricom in Nairobi. Safaricom is internationally recognised as a company that works to make a positive societal contribution, alongside delivering strong financial performance. It is a part of the UN Global Compact, and in the last few years has taken action to prioritise climate change, made significant investments in Kenyan health (m-Tiba) and in education (Mpesa Foundation Academy). There is evidence that the company’s CSR [Corporate Social Responsibility] strategy plays a significant role in its ability to maintain a competitive edge, and the company’s commitment to producing an annual sustainability report is line with findings which show that CSR disclosures have a positively reciprocal relationship on brand value. Safaricom has made a commitment to reporting on diversity and pushing for inclusion in the workplace. In December 2018, Safaricom CEO, Bob Collymore, published a post on LinkedIn discussing the business benefits of diversity and inclusion. In the post, he specifically mentions sexual orientation. To promote this post, the Safaricom Facebook page shared a post on 16 December that specifically mentions that sexual orientation is an aspect that produces better functioning workplaces. A direct message from the CEO provides a strong signal that Safaricom has made a serious commitment to diversity, and LGBT+ inclusion. It demonstrates that the company recognises the business case, and particularly that diversity is core to driving productivity and attracting great talent. Indeed, Safaricom has been consistently recognised as a top place to work in Kenya. 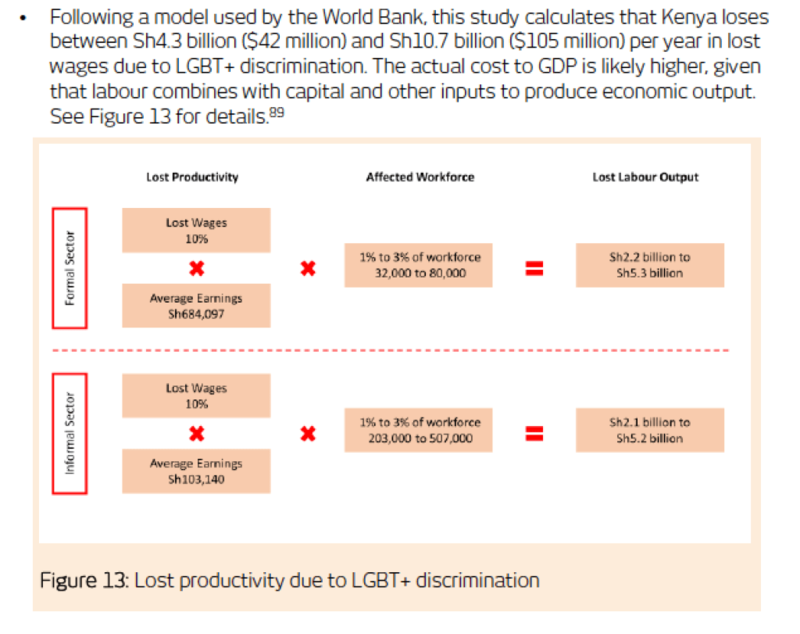 Here’s how the Open for Business report estimated lost productivity in Kenya because of anti-LGBT+ discrimination. 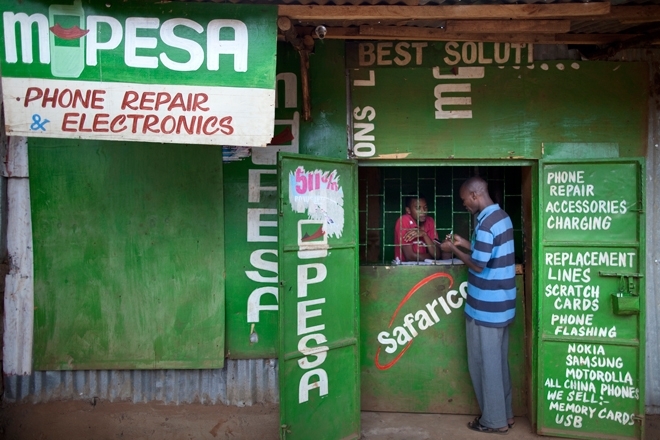 This article was corrected on Feb. 28, 2019, to include the example of Kenya-based Safaricom, which Open for Business cites. The earlier version of this article incorrectly discussed the South Africa-based tourism company Safari.com.